While USD is being under pressure for Fed’s decision on keeping rates unchanged, EUR is being empowered due to the positive statistics from Germany and Italy. 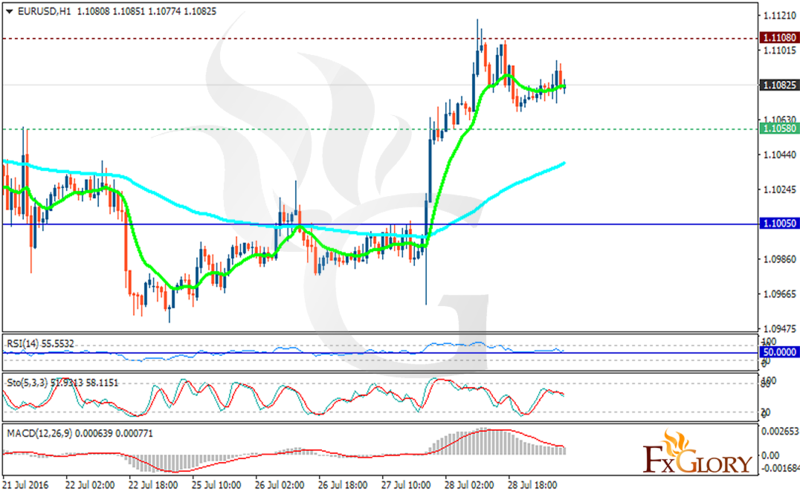 The support rests at 1.10580 with resistance at 1.11080 which both lines are above the weekly pivot point at 1.10050. The EMA of 10 is moving horizontally and it is above the EMA of 100 which is rising. The RSI has fallen to the 50 level, the MACD indicator is falling down from the positive territory and the Stochastic is showing downward momentum. The potential decrease is towards 1.100 area.